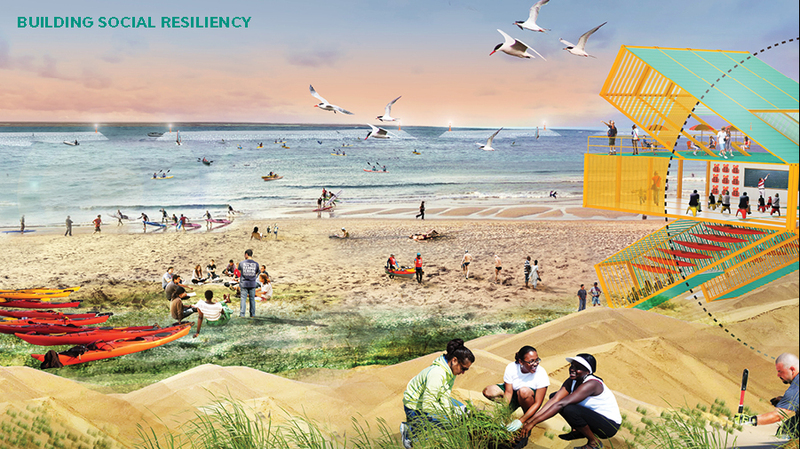 On Friday, Rebuild By Design (RBD) hosted a conference at NYU to check in on the progress on the region’s ten coastal resiliency projects. 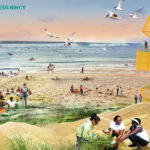 Landscape architects, engineers, architects, and government officials representing the six initial winners and four finalists spoke on behalf of their team’s ideas. 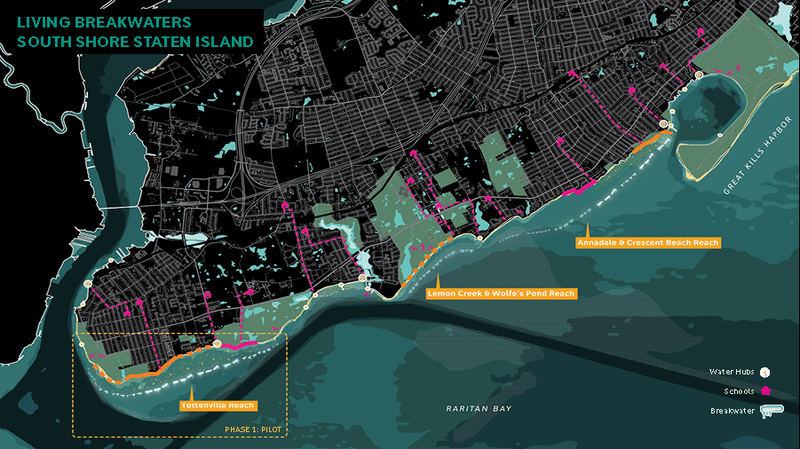 Although each project is different in scale and scope (factors which correlate, not surprisingly, to the level of funding that each received), and all are at different phases of implementation, projects from Bridgeport, CT to Hoboken, NJ reflect a desire to build back, but better: Plans enhanced oceanfronts, baysides, riverbeds, and low-lying areas with graywater remediation, waterside parks, berms with bicycle paths, and oyster beds, and other amenities to enhance both resiliency and waterside quality of life. Consistent challenges emerged, too. Foremost was the challenge of implementing projects that require input and approval from multiple government agencies with varying jurisdictions and priorities. Community engagement is key to each project, with many teams noting that initial designs were modified in accordance with the input of property owners, business leaders, and residents. Construction on the first phase of the projects is expected to be complete by 2022. 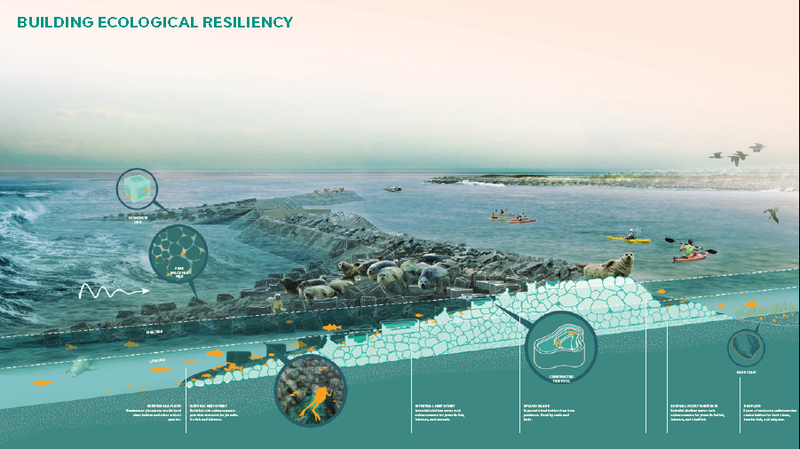 Although each project will undoubtedly make its area more resistant against 100-year floods, the most ambitious projects were the buffer of berms and floodwalls on Manhattan’s shoreline that stretches from East 25th Street around the southern tip of the island, and Living Breakwaters, a series of wave-breaking rock-and-oyster-colony formations placed off the south shore of Staten Island. The draft scope of work is out, and a draft Environmental Impact Statement (EIS) is being developed. 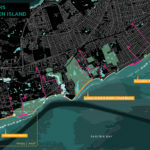 Next steps include “drilling down on the design,” and the environmental and land use review, although the design leaves the opportunity for additional bridges to be constructed at a later date. $335 million of the project’s funding comes from HUD’s Community Development Block Grant Disaster Recovery (CDBG-DR) Program and $170 million in capital funds from the city. Construction is expected to begin in June 2017. The Two Bridges portion is being financed with an additional $176 million (CDBG-NDR) and $27 million from the city. 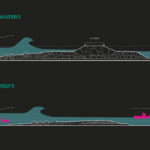 Alex Zablocki, a senior program manager at the NYS Governor’s Office of Storm Recovery and Pippa Brashear, director of planning and resilience at SCAPE/Landscape Architecture, closed the presentations with updates on Living Breakwaters, a stormproofing plan for the South Shore of Staten Island. 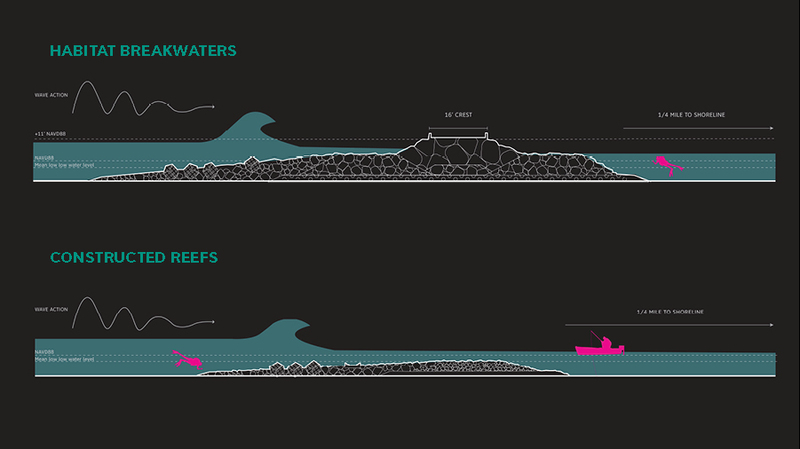 SCAPE’s design calls for network of submerged and partially-submerged concrete-and-recycled-glass breakwaters that will be planted with oysters. 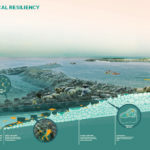 Living Breakwaters, Brashear explained, creates double resiliency by both mitigating the impact of shore-bound waves and “enhancing ecology” through natural water filtration (the project is partnering with the Billion Oyster Project, an initiative to re-seed oyster beds in the New York Harbor). 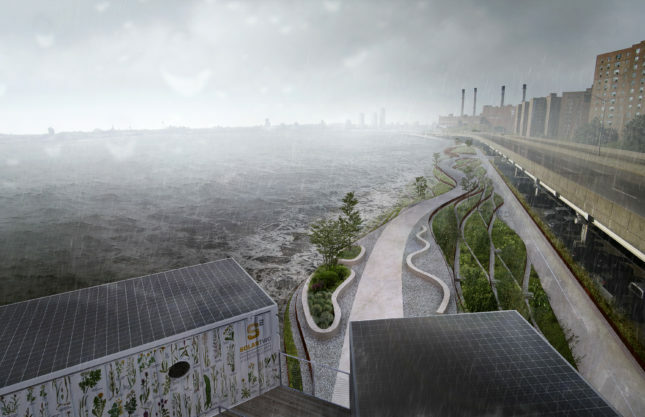 To SCAPE, the strategy was not about keeping water out through walls and barriers, but about reducing the impact of flooding in the vulnerable Tottenville neighborhood. Plans call for a rocky habitat shoreside with semi-enclosures for kayaking. 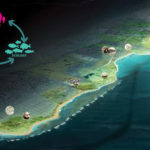 The video above, from 2014, explains the coastal interventions in-depth. 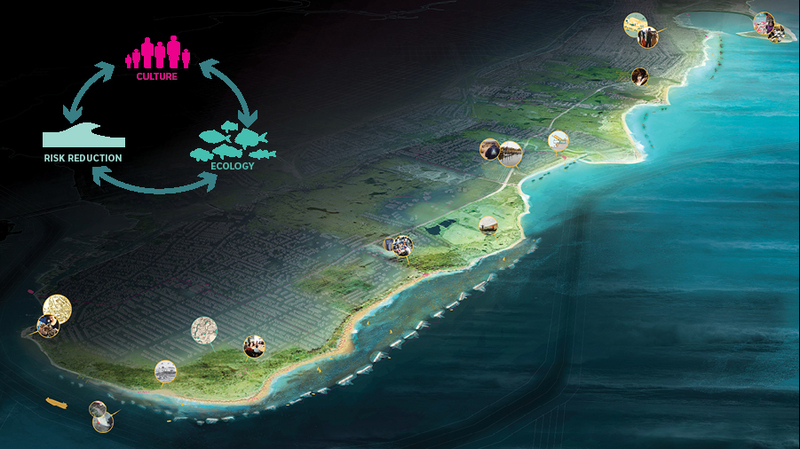 Between winning the RBD competition in 2014 and now, SCAPE has surveyed the coastline—above and underwater—extensively, and construction is expected to begin in the second quarter of 2017.